Cover of Wisdom, Number 2 1984. 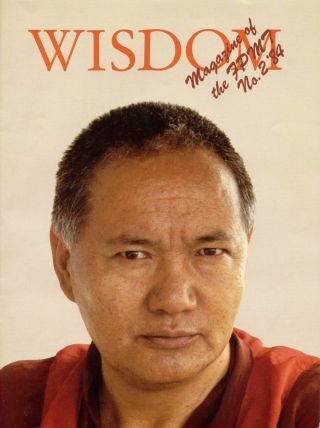 Photo of Lama Yeshe by Ueli Minder, taken in Geneva, Switzerland, 1983. The Tibetan New Year, Losar, falls on February 5 this year. For FPMT students, this day has additional significance as it commemorates the anniversary of the parinirvana of Lama Yeshe, who co-founded FPMT with Lama Zopa Rinpoche. Lama Yeshe’s heart stopped beating just before dawn on Losar, March 3, 1984. He was forty-nine years old. In 1959, Lama Yeshe fled the Chinese Communists in Tibet, going into exile in India. He survived tremendous hardship living as a refugee monk in Buxa Duar, where Lama Zopa Rinpoche became his student. Then in 1967, the two lamas began teaching Western students, leading to the establishment and flourishing of Kopan Monastery in Nepal and the FPMT organization throughout the world. As part of Lama Zopa Rinpoche’s advice on how to celebrate Losar and the Fifteen Days of Miracles, Rinpoche recommends that centers host events to introduce new students to Lama Yeshe. These events might include students who knew Lama Yeshe sharing their favorite stories, watching videos of Lama teaching, or reading stories about Lama. In that spirit, we’re highlighting Wisdom, Number 2 1984. Wisdom was the precursor to Mandala magazine. Its second issue, published not long after Lama Yeshe’s death, commemorated Lama. The issue included some of the last teaching from Lama Yeshe, a report on his passing, and tributes from Tibetan geshes as well as from Western students. “… During these past years Lama Yeshe has done so much beneficial activity for so many people, especially in the West. In fact, these two teachers, Lama Yeshe and Lama Zopa, have done such a wonderful job. The result is everywhere in the West—so many centers, so many students who follow the teachings seriously. “And because of all this activity the students have such a wonderful opportunity to meet other teachers, to receive many, many instructions and teachings. Even in Tibet we didn’t have that kind of opportunity! To have high lamas teaching all the time and giving high initiations, to have all this available is very, very rare.